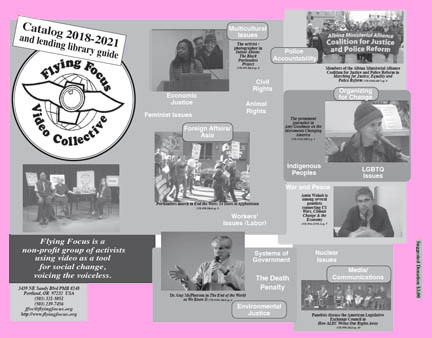 The Flying Focus Video Collective, a tax-exempt 501(c)(3)educational organization, has been producing works since January, 1991. Over 900 programs dealing with public policy issues have been cablecast and shown at occasional public screenings. The succinct version of our mission statement: Activists using video as a tool for social change, voicing the voiceless. NEW! in 2019: Have a comment or question? Text us at 503-321-5051! Flying Focus was able to raise money from supporters and two grants from Mt Hood Cable Regulatory Commission toward computer editing, we continue to accept donations by mail or on line toward production. Global Exploitation and the Grassroots Response"
Human Stories of US Wars"
• "Portland: Get Back Out of the Terror Task Force"
• "Current Wars, New Wars Street Wars-10/17"
What are all these programs anyway? Read our latest newsletter (February, 2019) New! and/or give feedback on our shows/website! Since October 2011: Donate on line through Network for Good. What is the story behind Flying Focus Video Collective? *Q: How can I get a printed copy of the Flying Focus catalog? A: Send $3.00 check or money order to our address, below, and note you want a catalog of available videos. **Q: Why can't I order DVDs/tapes directly from this website? for when you receive something of value in return for your donation. about the value of the DVDs/tapes and your accountant about what is tax deductible.